Graham Cracker Fudge has invaded my cookie jar dorm room! Remember how I had some crust leftover from my Key Lime Pie? Well, that was one delicious crust and it made for some great snacking--so moist and packed with flavor--too bad it only lasted me a couple days. I knew I had to make the crust again, but I didn't have time to make a whole pie. I needed something fast and easy, I needed something that I could take on-the-go. 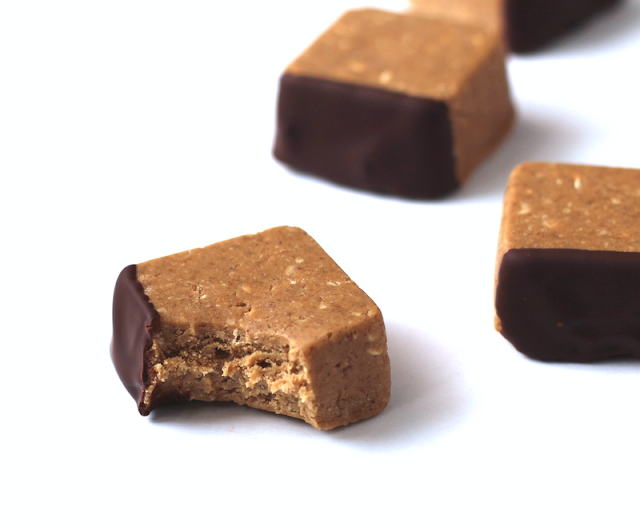 These fudge bites fit the bill. I slightly tweaked the crust recipe and pressed the dough into a nonstick mini brownie mold and was awarded with twenty-eight cute baby bites for sweet snacking! I crossed my fingers and hoped that they would last for more than two days. 1. In a large blender, blend the oats and sucanat until flour-like and pour into a large mixing bowl. Whisk in the protein powder, cinnamon and salt. 2. Microwave the coconut butter, honey and molasses in a microwave-safe bowl at 15 second intervals, stirring between each one, until the coconut butter is melted. Add the extracts and stir. 4. Press the mixture into a brownie mold with 1" molds, or line a standard brownie pan with parchment paper and flatten the mixture into it. Freeze for 30 minutes. 5. Microwave the chocolate in a microwave-safe bowl at 30-second intervals, stirring between each one until chocolate is melted, let cool slightly. 6. Take your beloved fudge bites out of the freezer and pop each one out of the mold onto some parchment paper taped to a cookie sheet or large, flat plate. If using the standard brownie pan, slice the fudge into little squares with a sharp knife. 7. Dip each square into chocolate and place on the parchment paper. Return the bites to the fridge (or freezer if you want the express route) until chocolate is completely hardened. Now, it's time for the giveaway! I told you guys another one was coming ;) Plus, Thanksgiving is right around the corner and a little present would be nice, right? This time, I am giving away four large bottles of stevia extract and picking two winners (so two bottles each). Liquid stevia extract is a natural, calorie-free sweetener that I use in many of my recipes. It isn't dangerous like aspartame, and it's natural, unlike many other calorie-free sweeteners out there. Stevia is very potent, so only a few drops will sweeten a food or drink easily and instantaneously, so you don't have to fuss with a bunch of sugar packets! Stevia saves you a lot of calories and prevents those dreaded sugar rushes and sugar crashes, as it doesn't affect blood sugar levels. It has been a godsend to me when I removed processed sugar from my diet and when I lowered my overall sugar intake. I have received comments in the past about how stevia is hard to find in the grocery store, many times it isn't even sold in stores, so I thought this would be the perfect giveaway! I myself have never seen stevia in a regular grocery store, only in health food stores, so I usually buy it off of Amazon.com ... a website where everything imaginable is sold. The bottles I buy are pretty large and they both usually last me a few months, so it will probably last half a year or longer for the winners... you see, I successfully bake on occasion, and I fail at baking quite frequently--sad, I know--so I go through the bottles at a faster pace than a normal human being baker would. Giveaway starts now and ends Monday, November 21st at 11:59pm. I will use this program to randomly choose a winner, and will announce the lucky individual on Tuesday, November 22nd, so make sure to check back at that date to see if you won! These are so cute and look absolutely delish! I would probably cover them completely in chocolate, but overall they sound fabulous! mmmm I would love to have four, erm one, right now! I would also love to try this extract especially for baking!! Those look amazing. I gotta say I love how neat and tidy they look, especially with the chocolate dipped edge. For some reason I can never get anything dipped in chocolate to look that nice, haha. And they look delicious! I love being able to see the texture from the bitten one. I already use a liquid stevia like that, but I believe it's NuNaturals. I love it so I'm curious to try SweetLeaf. I really can't live without my liquid stevia, it's awesome stuff. I'd love to try this product! I bake a lot during the holidays. I have never tried stevia but I am intrigued. Oh my goodness, you wouldn't believe how big a role model you've become to me. I'll be college bound next fall and I'm a health-conscious vegan with a dream of pursuing pastry or nutrition. I don't know it you'll see this, but if you do, do you have any books (cookbooks or not) to recommend for a nutrition-obsessed baker? Or pastry arts at all. Would love to try this ! this recipe looks ace! bookmarked it. I've always wanted to try using stevia. I love how you always can come up with delicious recipes that are extremely healthy at the same time. 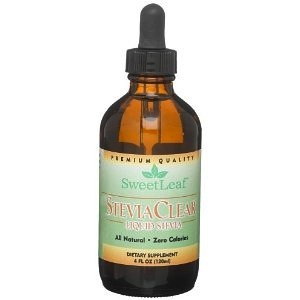 I love using stevia, never tried sweet leaf but i'm sure it's awesome. I've just subscribed to your site and want to try everything, it is so unfair =). I am so obsessed with trying to make new recipes from healthy and whole food items. I've just created my own blog about nutrition and health, as I would like to study dietetics, similar to nutritional sciences! http://theroadnotprocessed.com/ , it's still in the process of completion but your blog really helps motivate me since it's nice to know there are others out there with a crazy passion about food like me. Your blog is great, never stop! This recipe, on this newly found favorite blog of mine, is precisely the reason why I love baking/cooking... and why my fiance is now fat. oh wow, these look wonderful! i've just recently found out how great coconut butter is, and i use liquid stevia in my smoothies every morning but have never used it any other way. i'm definitely trying this recipe! Cheesecake base in a fudge square!!! My first time on your blog-wonderful post! I'm looking to cut processed sugar out of my diet as well. My family has a history of diabetes and cancer. Thanks! These look awesome! Stevia is sold in a powder form by the name of "trulia" in a lot of stores now, woo! stevia! love it! 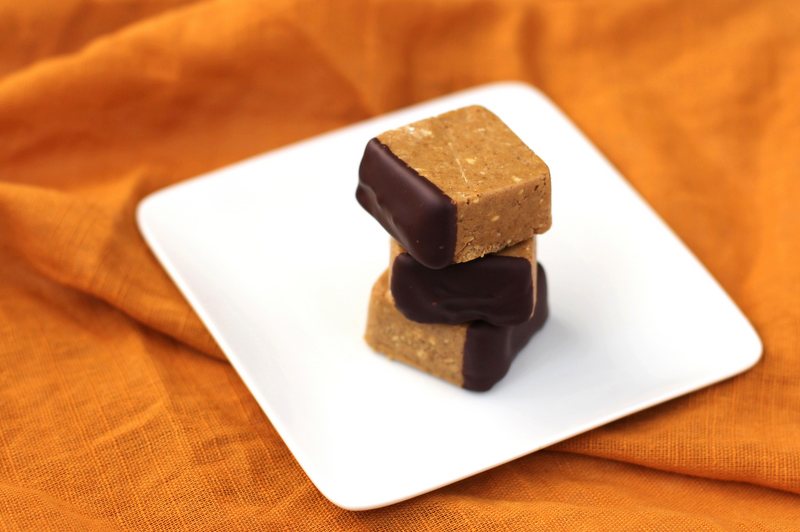 those graham cracker fudge bars look tasty! omg.. the fudge squares look so prettty.. and so clean.. and lovely pictures too! thanks for sharing the recipe.. i need to make these sooooon! Love your blog! I'm a college student myself and your recipes inspire me. I've never tried baking with stevia and I hope to try it soon! I use stevia a lot, and I share my bottle with my roommate who is making my supply run out twice as fast! I'm going to need a new bottle pretty soon here so it would be AWESOME to win this! Your recipes always look so impressive and perfectly delicious! Looks so delicious! I am going to make these in the very near future! Alexa R- High heat may denature some of the proteins, but minerals like calcium are not destroyed by heat. I wish I knew more about the protein denaturing, but I haven't learned much about it yet... hope this helped at least a little! I just made these, and they are delicious! Thank you! These look fantastic! I'm impressed that you do all of this at your dorm. Kudos to you! Loving these recipes [stumbled upon here from the mint krispy post via tastespotting :)]! OMG MY TWO FAVERIOTE SWEETS, GRAHAM CRACKERS AND CHOCOLATE!!!! YUM! Graham is really the key to this recipe being nutritious. A mixture of white flour, wheat bran and germ, it was known as a health food for as long as the old times. It was a certain Rev.Graham who used this biscuit to clean the inner (emotional/spiritual,etc) body. Totally makes sense, if I may say. Wow! What a smart thing to use to cook! I used to get severe migraines and my doctor said that he thought it was from the aspartame in my soda. So I avoid aspartame as much as I possibly can! This would be a great substitute!! Graham cracker fudge -- how unique. I lived on these as a child, and have grown up to bake my own. Really intrigued by this idea! I'm making these for my hubby asap. He's got the massive sweet-tooth in the family and I'm always looking for new, healthier ways to feed his beast! I've always wanted to try Stevia. The fudge looks amazing! Very ingenious. And liquid stevia is quite fascinating. I definitely want to try this! I keep seeing liquid stevia in recipes. I've tried the powdered stuff, but I'd like to try the liquid. Graham crackers are the best, so these are looking real good to me right now! Those are the cutest little fudge bites I have ever seen! and thanks for the giveaway too! Mmmm, those look like nomz. And stevia sounds very interesting, perhaps I'll replace my splenda with stevia next shopping trip (if I remember). Those look like nomz! And I'll have to remember about stevia. Mmm, this looks like such a delicious treat! Definitely going on a to-make dessert list. I love your recipes! They sometimes remind me of molecular gastronomy :) And I'd love to try stevia extract. This website is a gem, I am so happy I found it today! I am going to give these, and about a dozen other recipes on this site, a try this month! Thanks for sharing your creativity and passion with us! Wow! These look so great. Can't wait to try it! I've been craving chocolate dipped digestive biscuits from England (choco covered graham crackers)for so long and these look soo good and quite healthy which is always a plus. Never knew they had liquid stevia extract...cool! Thanks for your yummy posts! looks delicious. have you thought about adding dried fruit or nuts? kinda makes it more like trail mix though. I'm gonna have to try that Chocolate (Smores Wannabe) Pie. Sounds so good! And we love chocolate pie in this house! I love baking so winning the stevia extract would be great! Thank you for the opportunity! i love your recipes! THey are healthy but amazing tasting! I would love to try baking with Stevia. I'm a dietitian and I love to experiment with recipes to make them healthier! Thank you for sharing your healthy and scrumptious recipes! I just came across your blog the other day and I was in heaven :) I can't wait to make the mint chocolate crispy treats. I have a HUGE sweet tooth, but I find it hard to satisfy since there are usually an unhealthy amount of fat, sugar, etc. in most recipes. I'm also in college and very inspired by nutrition so I am(try to be) aware of what I put in my body these days! Just stumbled upon your blog and loving the recipes. I've never tried that kind of liquid stevia before! These look so good! I can't wait to try these! OMG... these are sooooooo delicious! I didn't use Stevia because I didn't have any, and they were plenty sweet enough. I also used the agave because I wanted to make them vegan for some friends at work. Maybe it was the molds I used (cute ones from Ikea), but this mixture was particularly sticky and hard to remove (even after freezing). Is there a trick you can share with me? Maybe a shot of non-stick cooking spray or a coat of coconut oil?